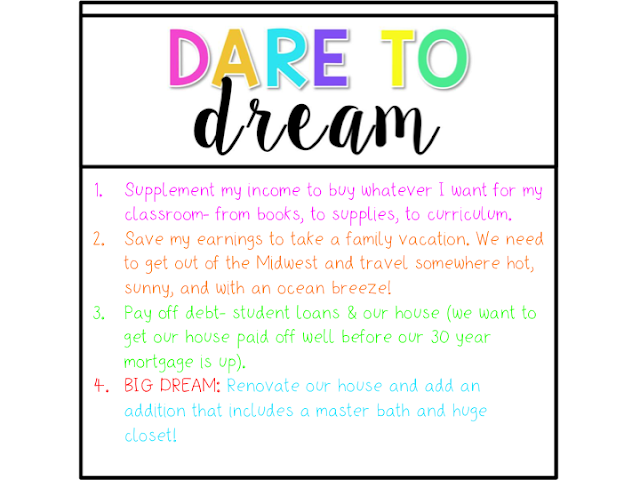 TPT Seller's Challenge Week 2: Dare to Dream - All Things Special Ed. This week's challenge is called, "Dare to Dream" and here are my hopes, wishes and dreams. 1. I love my classroom and I want to be able to supply whatever I need for my students. If it is velcro, lamination, books, or a curriculum I want I would love to be able to provide that without worrying about making ends meet at home. 2. 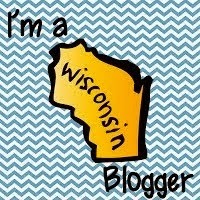 I love to travel and we haven't been able to take the kiddos on a trip outside of where we live- the Midwest. My husband is trying to go back to school and make a career change so money is tight. I would love to take my boys to the ocean and hang out at the beach all week without worrying about money. 3. Oh money- how I want to pay off debt. I still have student loans- undergrad and from my masters program. Wouldn't it be nice to not have that?! Now with my husband back in school that will go up. Also we would love to pay off our house sooner than our 30 year loan. 4. Our big dream is to renovate our house and add an addition. We would love to gut out our kitchen, add on to our master bedroom and give ourselves a master bath and walk-in closet. Let's not forget our ugly family room- fireplace, flooring and ceiling- can HGTV come over and do all this please!? Wouldn't it be amazing if all this could happen? Hopefully some day- what are your dreams?